The Buckley War Memorial, at Hawkesbury, commemorates those Buckley men who fell in World War I and World War II. The memorial was unveiled on 9th September 1951. The World War I Memorial includes the names of 114 soldiers from Buckley who died in the First World War, however, the total number who died likely exceeded 150. Buckley (Welsh: Bwcle) is a town and community in Flintshire. Between 1974 and 1996 it was in the county of Clwyd. Son of Samuel & Hannah Antrobus, 2, Willow Cottage, Buckley. Gouzeaucourt New British Cemetery, Nord, France. 26 Son of John and Francis Esther Bevan, Bistre, Buckley. Also named on the Mold War Memorial Thiepval Memorial, Somme, France. Son of Edward & stepson of Margaret H Bewley, of Ash View, Alltami. Port Said War Memorial Cemetery, Egypt. Adopted son of Alfred & Annie Hayes, of 35, Padeswood Road, Buckley. Son of Samuel & Mary Birks. Born in Buckley. Brother of Mrs Elizabeth Peters, of 31, Lane End, Buckley. Mikra British Cemetery, Kalamaria, Greece. Of Tyddyn, Mold, drowned when the Royal Mail Steamer Leinster was torpedoed in the Irish Sea. Royal Hospital Cemetery, Kilmainham, Dublin, Ireland. Husband of Edith Brown, 33, Spotted Row, Burntwood, Buckley. Citadel New Military Cemetery, Somme, France. Son of Henry Brownbill, Bickerstaffe, Lancashire, England; husband of Martha Brownbill, of The Anchorage, Bickerstaffe. Lancashire, England. Bickerstaffe Holy Trinity Churchyard, Lancashire, England. Son of Peter & Mary Anne Burrows, of 104, Mold Road, Buckley. Son of Thomas Catherall, of 4, Bank Road, Spon Green, Buckley. Menin Gate Memorial, Ieper, West-Vlaanderen, Belgium. Son of Edmund & Martha Ann Catherall, of Stanley Road, Buckley. Jerusalem Memorial, Israel. Son of George & Ellen Catherall, of 45, Chester Road, Buckley. Son of Edward Catherall, Tram Road, Buckley, Flintshire. Menin Gate Memorial, Ieper, West-Vlaanderen, Belgium. Son of John & Hannah Catherall, of 14, Spon Cottage, Buckley. Son of Jonathan & Margaret Frazer Catherall, of Hawkesbury, Buckley. Son of Nicholas & Eliza Collins, of Buckley. Also named on the Hawarden War Memorial. Tezze British Cemetery, Italy. Son of Mrs Mary Ann Connah, of 27, Brook Street, Buckley. Brother of James and John Connah (below). Lebucquiere Communal Military Cemetery Extension, Pas de Calais, France. Son of Mrs Mary Ann Connah, of 27, Brook Street, Buckley. Brother of Alexander (above) and John Thomas Connah (below). Bienvillers Military Cemetery, Pas de Calais, France. Son of Mrs Eliza Connah, of 86, Mold Road, Buckley. Son of Mary Ann Connah, of 27, Brook Street, Buckley. Brother of Alexander and James Connah (above). Mendingheim Military Cemetery, West-Vlaanderen, Belgium. Son of Arthur & Sarah Elizabeth Cox, 24, Mold Rd, Buckley. Son of Mr J Davies, 33, Moss Hill, Wrexham. Resident of Ewloe Green. Also named on the Hawarden War Memorial. Royal Irish Rifles Graveyard, Laventie, Pas de Calais. Son of Edwin & M E Davies, Sunny Side, Nant Mawr Road, Buckley. Son of Robert and Elizabeth Davies, Mill Lane, Buckley. (1911 Census). Also commemorated on the Connah's Quay and Shotton War Memorial. Loos Memorial, Pas de Calais, France. Brother of Thomas John Davison, of 4, Daisy Hill, Buckley. Poperinghe New Military Cemetery, West-Vlaanderen, Belgium. Son of Charles William & Kate Dolby, of 15, Church Road, Buckley. Son of Samuel & Mary Catherine Dunn, of Hillside, Liverpool Road, Buckley. Lijssenthoek Military Cemetery, West-Vlaanderen, Belgium. 23 Son of Joseph Edwards, Alltami, Buckley and husband of Jane Ellen Edwards, Blue Bell, Maes y Dre, Mold. Also named on the Mold War Memorial. Arras Memorial, Pas de Calais, France. Son of Thomas & Elizabeth Ellis, 70, Mold Rd, Buckley. Brother of John Ellis below. Tourgeville Military Cemetery, Deauville, Calvados. Son of Thomas & Elizabeth Ellis, 70 Mold Rd, Buckley. Brother of Arthur Ellis above. Le Touret Memorial, Pas de Calais, France. Son of James & Mary Ellis, 118, Liverpool Road, Buckley. Son of Joseph & Agnes Evans, of The Square, Mancot. Son of William and Dinah Evans, Chapel Street, Mynydd Isa. Tyne Cot Memorial, Ieper, West-Vlaanderen, Belgium. Son of Mr & Mrs Jabez Evans, 5, Bank Buildings, Buckley. Loos Memorial, Pas de Calais , Pas de Calais, France. Son of Robert Arthur & Mary Fox, of Mountain, Alltami. Son of Richard Griffiths, Grandstand, Burntwood, Buckley. Oxford Road Cemetery, Ieper, West-Vlaanderen, Belgium. Cite Bonjean Military Cemetery, Armentieres, Nord, France. Quietste Military Cemetery, Le Cateau, Nord, France. Son of Joseph & Mary Ann Hayes, of Mount Terrace, Lane End, Buckley. Son of Absalom & Mary Elizabeth Hayes, of Crown Vaults, Buckley. Hamel Military Cemetery, Beaumont-Hamel, Somme, France. Husband of Annie Hewitt. Father of Florence J Hewitt born 25/12/1911. Also named on the Northop and Sychdyn (Soughton) War Memorials. Tyne Cot Memorial, Ieper, West-Vlaanderen, Belgium. Son of Frank & Mary Hodkinson, Magazine House, Ewloe Green. Also named on the Northop and Northop Hall War Memorials. Vermelles British Cemetery, Pas de Calais, France. Son of John & Jane Hopwood, of Pren Brigog, Buckley. Husband of Sarah Ann Hopwood, of Stone Cottages, Mynydd Isa. Also named on the Mold War Memorial. Gaza War Cemetery, Palestine. Son of Edward Henry & Florence E Hughes, 168 Lipton Street, Winnipeg, Canada. Emmanuel Cemetery, Bistre. Born Liverpool, England. Son of Mary Ann Griffiths of High Street, Buckley. Husband of Martha Marie Hughes. Son of William & Mary Iball of Wynne's Yard, 77, Mold Rd, Buckley. Son of Peter & Martha Iball, of 2, Washington Grove, Bentley Road., Doncaster, Yorkshire, England. Born in Buckley. Brother of George Iball below Etaples Military Cemetery, Pas de Calais, France. Son of Peter & Martha Iball, 2 Washington Grove, Bentley Road, Doncaster, England. Born in Buckley. Brother of Charles Iball above North Gate War Cemetery, Baghdad, Iraq. Son of John & Margaret Iball of 104, Daisy Hill, Buckley. Erquinghem-Lys Churchyard Extension, Armentieres, Nord, France. Son of James & Ellen Iball, of 20, Church Road, Buckley. Tyne Cot Memorial, Ieper, West-Vlaanderen, Belgium. Son of Henry & Hannah Jackson, 39, Stanley Road, Buckley. Delville Wood Cemetery, Longueval, Somme, France. transf. to 805th Area-Employment Coy. Son of John & Elizabeth Jellicoe; husband of Helen Jellicoe, of 34, Sycamore Road, Broseley Wood Shropshire, England. Born in Buckley. Son of Alfred and Elizabeth Jones, Main Street, Buckley. Arras Memorial, Pas de Calais, France. Son of Thomas & Mary Emma A Jones, 46, Brunswick Rd, Buckley. Brother of Herbert Jones below. Jerusalem War Cemetery, Israel. Son of Thomas & Mary Emma A Jones, 46, Brunswick Rd, Buckley. Brother of Arthur Jones above. Tyne Cot Memorial, Ieper, West-Vlaanderen, Belgium. Of Brunswick House, Buckley. Son of Richard & Mary Jones of Caernarfon. Caterpillar Valley Cemetery, Longueval, Somme, France. 24 Son of Thomas & Elizabeth Jones, Clayton House, Church Road, Buckley. Husband of Mrs S Jones, 51, Ewloe Place, Buckley. Born Llanbrynmair, Montgomeryshire. Son of Elizabeth Wilcock (formerly Jones), 84, Tram Road, Buckley, & the late Hugh Jones. Born in Caernarfon. Son of Thomas & Margaret Jones, Square Post Office, Buckley. Montay-Neuvilly Road Cemetery, Montay, Nord, France. Born in Buckley. Husband of Mary Elizabeth McDermott (formerly Knight), 44, Milford Street, Mold. Also named on the Mold War Memorial. Dozinghem Military Cemetery, Poperinge, West-Vlaanderen, Belgium. Son of David & Martha Lewis, Mill Lane, Buckley, husband of Eliza Ann Lewis, 136 Mold Road, Buckley. Vermelles British Cemetery, Pas de Calais, France. Son of Thomas & Marguerite Lewis, South Lane, Buckley. Ovillers Military Cemetery , Somme, France. Husband of Bertha Lovelock, of 73, Ewloe Place, Buckley. Son of Joseph William & Rosalind Lyndsell, of 43, Mold Road, Buckley. La Kreule Military Cemetery, Hazebrouck, Nord, France. Probably son of Charles & Jane Millington, Buckley Square, Buckley. Son of Edgar & Georgina Mole, of Somerville, Nant Mawr Road, Buckley. Ramleh War Cemetery, Ramlah, Israel. Son of Charles & Margaret Molyneux, 18, Mill Lane, Buckley. Son of William & Annie Nickson, Cross Keys Inn, Buckley. Grevillers British Cemetery, Pas de Calais, France. Son of William & Martha Owens, of 151, Brunswick Road, Buckley. Lebucquiere Communal Cemetery Extension, Pas de Calais, France. Son of Elizabeth & John Parry, Megs Lane, Buckley. Husband of Mary Ann Parry, 14 Aberdovey Terrace, Buckley. Etaples Military Cemetery, Pas de Calais, France. 78340 Royal Welsh Fusiliers (2nd Bn.) 21 Oct 1918 20 Son of Mrs S J Parry, 94 Mold Road, Buckley. Beaulencourt British Cemetery, Ligny-Thilloy, Pas de Calais, France. Son of Mr & Mrs Parry, 110 Brunswick Road, Buckley. Hill 10 Cemetery, Gallipoli, Turkey. S4/158661 Army Service Corps (14th Div. Train) 7 Apr 1917 28 Son of William & Eliza Peters, 72, Spon Green, Buckley. Arras Memorial, Pas de Calais, France. Son of Stephen & Kate Price, Buckley Common, Buckley. Of Bryn y Baal. Born Malpas, Cheshire, England, son of Charles & Hannah Richards. Son of William and Hannah Roberts, Chapel Street, Mynydd Isa. Also named on the Mold War Memorial. Helles Memorial, Turkey. Son of William and Hannah Roberts, of 81, Brunswick Rd., Buckley, Chester. 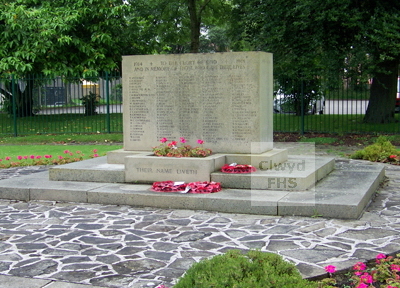 Also named on the Connah's Quay and Shotton and Hawarden War Memorials. Caterpillar Valley Cemetery, Longueval, Somme, France. 16019 Royal Welsh Fusiliers (9th Bn.) 2 Oct 1915 21 Son of Mr & Mrs Thomas Roberts, 45 Ewloe Place, Buckley. Loos Memorial, Pas de Calais, France. Husband of Cecily Rogers, Humphrey Lane, Urmston, Manchester, England. Foster son of Mrs M Birks, White House, Mount Pleasant, Buckley. Son of William & Elizabeth Rowlands, of Nant Mawr Farm, Buckley. St Sever Cemetery Extension, Rouen, Seine-Maritime, France. Son of Alfred & Esther Shaw, Spon Green, Buckley. Tincourt New British Cemetery, Somme, France. Son of Samuel & Elizabeth Shone, of Buckley. Son of Elizabeth Spencer, 131, Mold Rd, Buckley & the late Thomas B Spencer. Ovillers Military Cemetery, Somme, France. Son of Thomas & Elizabeth Stanley of Ewloe Barn Farm, Ewloe. Bucquoy Road Cemetery, Pas de Calais, France. Son of Edward & Emily Tatum, of 1, Church Road, Buckley. Loos Memorial, Pas de Calais, France. (2/4th Bn. Territorial Force) 26 Oct 1917 28 Born Rawtenstall, Lancashire, England. Son of George & Jane Ann Terry (nee Taylor); husband of Veronica Whittam Rowe of Burnley, Lancashire, England. Tyne Cot Memorial, Ieper, West-Vlaanderen, Belgium. Son of Mrs Catherine Tomlinson, of 47, Burntwood, Buckley. Lonsdale Cemetery, Authuille, Somme, France. Son of Edward & Mary Tomlinson, of 47, Drury Lane, Buckley. Son of Thomas & Martha Warburton; husband of Maria Warburton, 61, Mold Rd, Buckley. Son of Mr & Mrs Joseph Whitley, Mount Terrace, Lane End, Buckley. Son of Peter & Sarah Wilcock of Victoria Terrace, Buckley. Son of Charles & Annie Wilcock, of Buckley; husband of Mary Elizabeth Bellis (formerly Wilcock), of Stone Row, Hawarden. Also named on the Hawarden War Memorial. Dragoon Camp Cemetery, West-Vlaanderen, Belgium. 29 Son of William & Mary Ellen Wilcock, of Didsbury, Manchester, England; husband of Elizabeth Williams, of Buckley. Menin Gate Memorial, Ieper, West-Vlaanderen, Belgium. Husband of Sarah Ellen Williams, 12, Myrtle Road, The Square, Buckley. 18470 & 247894 Royal Welsh Fusiliers transferred to (247894) 363rd Reserve Employment Coy. Labour Corps 13 Feb 1919 30 Son of Moses & Elizabeth E Williams, 2, Bank Buildings, Buckley. Emmanuel Churchyard, Bistre. Son of Edwin & Mary Williams of Waen Isa, Northop, and nephew of Edward & Mary Elizabeth Wilcock of The Common, Buckley. (Also commemorated on the Flint War Memorial). Jerusalem War Cemetery, Israel. Son of Ralph & Katherine Williams, Central Stores, Buckley. Son of John & Anne Williams, Spon Green, Buckley. Son of Mr R I & Mrs M A Williamson, 82, Mold Rd, Buckley. 26 Son of Henry and Annie Wood, 20 Milford Road, Mold. Husband of Catherine Wood. Also commemorated on the Mold War Memorial. Amara War Cemetery, Iraq. (8th Bn.) 9 Jun 1940 22 Son of Samuel and Adelaide Baldwin. Emmanuel Churchyard, Bistre. 14387168 East Yorkshire Regiment (2nd Bn.) 21 Jul 1944 20 Son of James & Bertha Brownhill, of Buckley. Emmanuel Churchyard, Bistre. (HMS Polyanthus) 20 Sep 1943 21 Son of Norman & Janet Waring Croose; husband of Eleanor Muriel Croose, of Northop. Portsmouth Naval Memorial, Hampshire, England. (7th Bn.) 13 Oct 1944 28 Son of Mr & Mrs Arthur Davies; husband of Menna Davies, of Betws y Coed, Caernarfonshire. Uden War Cemetery, Noord-Brabant, Netherlands. 1052736 Royal Air Force Volunteer Reserve (550 Sqdn.) 3 May 1944 36 Son of Thomas & Eliza Ellis, husband of Noreen Bessie Ellis, of Buckley. Cheniers Churchyard, Marne, France. 4193347 Grenadier Guards (2nd Bn.) 10 Apr 1945 26 Son of John Frederick & Edith Annie Eaton, of Mynydd Isa. Also named on the Mold War Memorial. Rheinberg War Cemetery, Nordrhein-Westfalen, Germany. 10532128 Royal Army Ordnance Corps 13 Feb 1942 21 Son of Samuel Fletche, of Saltney & Elizabeth Hughes. Singapore Memorial. 14387075 Royal Artillery (64 (The Queen's Own Royal Glasgow Yeomanry) Anti-Tank Regt.) 23 Jun 1944 33 Son of Frederick & Martha Ann Griffiths of Buckley. Orvietto War Cemetery, Italy. 14342634 Wiltshire Regiment (1st Bn.) 21 Apr 1944 33 Son of William & Mary Griffiths; husband of Edith Maud Griffiths, of Tividale, Tipton, Staffordshire, England. Rangoon Memorial. (6th Bn.) 17 May 1944 22 Son of William Thomas Hill & Catherine Hill, of Buckley. Cassino War Cemetery, Italy. T/10673247 Royal Army Service Corps 27 Oct 1944 22 Son of Alfred & Annie Hill, of Buckley. Assisi War Cemetery, Italy. (2nd Airborne Bn.) 22 Sep 1944 20 Son of John Leonard & Emily Mary Hopwood, of Mynydd Isa. Groesbeek Memorial, Gelderland, Netherlands. (HMS Tracker) 15 Apr 1944 21 Grandson of Eliza Hughes, of Buckley. Chatham Naval Memorial, Kent, England. 14374211 King's Own Yorkshire Light Infantry (2/4th Bn.) 5 May, 1944 22 Son of John Richard and Nellie Hughes, of Buckley. Faenza War Cemetery, Italy. HUMPHREYS 2736088 Welsh Guards (1st Bn.) 25 Jul 1944 24 Son of Joseph Wynne & Lilian Humphreys, of Buckley. Ranville War Cemetery, Calvados, France. 2201520 Royal Air Force Volunteer Reserve 11 Jun 1945 33 St. Matthew's Churchyard, Buckley. 14567237 Royal Welch Fusiliers (7th Bn.) 22 Sep 1944 19 Son of Edwin & Hannah Maria Jones, of Buckley. Bergen-Op-Zoom War Cemetery, Noord-Brabant, Netherlands. (12th Bn.) 11 Aug 1942 22 Son of Ernest D Jones & Ann Jones, of Mynydd Isa. Emmanuel Churchyard, Bistre. 974068 Royal Air Force Volunteer Reserve (512 Air Ministry Experimental Station (A.M.E.S.)) 18 Sep 1944 26 Son of Edward & Eleanor Jones of Buckley. Singapore Memorial, Singapore. (HMS Nith) 24 Jun 1944 26 Son of Walter & Elizabeth Langford; husband of Eileen Mary Langford, of Hoole, Cheshire, England. Plymouth Naval Memorial, Devon, England. (HMS Barham) 25 Nov 1941 26 Son of Andrew James & Menir Edith Lewis. Chatham Naval Memorial, Kent, England. 996813 Royal Artillery (457 Lt. Bty.) 10 Mar 1943 28 Son of James & Ada Lewis, of Buckley. Tabarka Ras Rajel War Cemetery, Tunisia. PLY/X 2469 Royal Marines (H.M.S. Illustrious) 21 Jun 1943 24 Son of Patrick & Edith Lyons, of Buckley. Emmanuel Churchyard, Bistre. Robert Stroud MALLETT British Overseas Airways Corporation 26 Sep 1942 Runnymede Memorial, Surrey, England. (SS Ceramic) 7 Dec 1942 36 Son of Neil & Maggie McAllister, of Buckley. Tower Hill Memorial, London, England. T/65221 Royal Army Service Corps (385 Gen. Transport Coy. attd. 15 Casualty Clearing Station, Royal Army Medical Corps) 21 Jul 1942 30 Son of Joseph & Margaret Milroy; husband of Mary Louisa Milroy, of Buckley. El Alamein War Cemetery, Egypt. OKELL Salford Royal Hospital 2 Jun 1941 20 Daughter of Elsie & Percy Okell of Liverpool Road Farm, Buckley. St. Matthews Churchard, Buckley. 1468724 Royal Artillery (76 Anti-Tank Regt.) 9 Mar 1942 25 Son of John & Polly Parry; husband of Frances Parry, of Lane End, Buckley. Tripoli War Cemetery, Libya. PLY/X 104025 Royal Marines, No. 41 R. M. Commando 11 Jul 1943 25 Son of Robert Henry & Mary Hannah Price, of Buckley. Syracuse War Cemetery, Sicily, Italy. 1624053 Royal Air Force Volunteer Reserve 13 Aug 1944 20 Son of Wilfred & Martha Roberts, of Buckley. Nonconformist Cemetery, Buckley. 4202106 Gloucestershire Regiment (1st Bn.) 28 Oct 1942 27 Son of Mr & Mrs John Roberts; husband of Lily Roberts, of Buckley. Also named on the Greenfield (Courtaulds) and Hawarden War Memorials. Rangoon War Cemetery, Burma. (2nd Bn.) 21 Apr 1945 28 Son of David & Nell Roberts; husband of Eleanor W Roberts, of Buckley. Argenta Gap War Cemetery, Italy. 4202134 Welch Regiment (2nd Bn.) 13 Jan 1945 29 Son of Lancelot & Sarah Emma Shone; husband of Gladys Bronwen Shone of Buckley. Taukkyan War Cemetery, Burma. (75 Sqdn.) 29 Jun 1942 29 Son of George & Edith Olivia Gwladys Shone; husband of Nellie Florence Shone, of Hoole, Chester, England. Becklingen War Cemetery, Niedersachen, Germany. (5th Bn.) 27 Jun 1944 33 Son of Charles & Harriet Shone; husband of Ellen Shone, of Saltney. Bolsena War Cemetery, Italy. 1036176 Royal Air Force Volunteer Reserve (57 Sqdn.) 24 Oct 1942 22 Son of John Hopwood Taylor & Hannah Taylor, of Mold. Ravenna War Cemetery, Italy. (HMS Whitaker) 1 Nov 1944 19 Son of Thomas & Elizabeth Whitley, of Buckley. Nonconformist Cemetery, Buckley. 913950 Royal Air Force Volunteer Reserve 3 Jan 1941 22 Son of James & Sophia Wilcock, of Buckley. Emmanuel Churchyard, Bistre. (HMS President III) 11 Sep 1941 26 Son of Walter & Jane Ann Williams; husband of Frances Williams, of Buckley. Chatham Naval Memorial, Kent, England. 14572456 Royal Corps of Signals (52nd (L) Div. Sigs.) 24 Apr 1945 20 Son of John Henry & Lydia Williams, of Buckley. Becklingen War Cemetery, Niedersachen, Germany. 1902560 Royal Engineers 18 Jun 1940 24 Son of Ernest Arthur & Alice Wilson, Liverpool Road, Buckley. Eastern Communal Cemetery, Rennes, Brittany.